The Inpatient Cost Evaluation Tool, or ICE-T, is a web-based cost evaluation tool and introduction to using bundled payment services. The ICE-T includes Compare and Rank tools which let anyone investigate which inpatient diagnosis related groups (DRGs) are best to bundle. These tools provide data on inpatient DRG frequency, cost quartiles, and rank using several years of national Medicare Part A and Part B claims data. The Tutorial section includes a guide to the components of the ICE-T. The Interpretation section provides a detailed introduction to bundled payment services, including an explanation of the Comprehensive Care for Joint Replacement (CJR) bundled payment model from CMS. The ICE-T also includes a Methods section and a Glossary. Compare Tool: This tool lets users compare up to four inpatient DRG components using several years of nationally aggregated Medicare data. 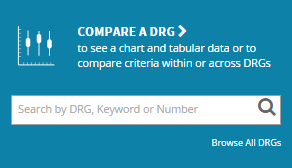 You can access it by searching for a specific DRG code in the right-hand “Compare A DRG” box, or you can click on “Browse All DRGs” to compare DRGs in the ICE-T. It also includes a legend and a table view of the data. Rank Tool: This tool lets users find and rank DRGs by frequency, cost, and more using several years of nationally aggregated Medicare data. Users can select how they would like to rank DRGs and can rank DRG information in descending or ascending order. They can also search for and then compare DRGs. You can also navigate the site by using the links in the navigation bar. Follow the links below for an in-depth tutorial on using each of the ICE-T components.